This is the traditional tool for flattening, thicknessing, and jointing. Unless you typically work very long (over 8") stock, it's not necessary to have a separate jointer plane-- the try plane will do it all. 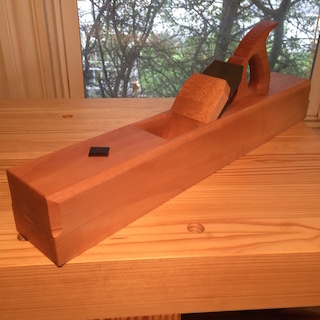 My standard try plane is 22" long with a 2 1/2" iron and a closed tote. For those who prefer a slightly longer plane, a length of 24" is also available. Because the try plane has such a wide iron, I recommend a bed angle of 45°; however, I'm happy to accomodate requests for 47.5°, the bed angle used in early double iron planes.